With all the news about The Walking Dead, this one almost got by. But Mantic's not just working on their upcoming zombies game. Oh no. They've also got all the pulse-pounding action of DreadBall that they've been working on. Every team is looking to be the best. But how do you know without a special trophy? Well, that's where the Challenge Cup Title comes in. Win that and everyone will know you're the greatest around. DreadBall isn't a game that's known for its subtlety or overly-strong sense of welfare for its players. 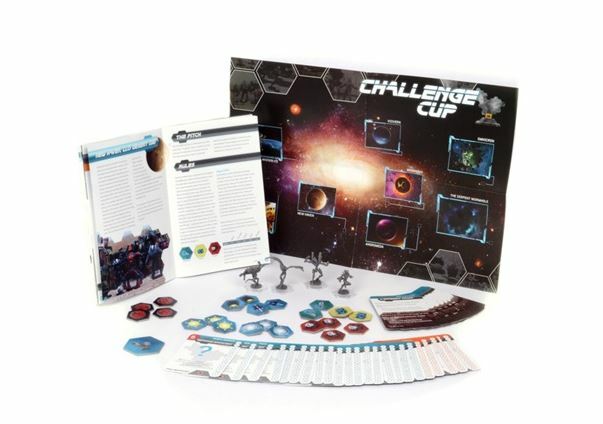 And the DreadBall Challenge tour shows it. Play your matches in pitches that are almost completely dark, and where stepping into the shadows could spell your end. Or how about trying to score points while leaping over flowing lava? As you can expect, there are players who know all about those dangers and can be recruited for your team, as the set includes four new ones. The set also comes with a new 40-page rulebook, a map, a new card deck, and a counter sheet. So get pumped and take the field, there's a championship to be won!